The West Bengal College Service Commission is going to conducting the 18th State Eligibility Test (SET) for the posts of Assistant Professors and Librarians in Universities and Colleges of West Bengal. It contacts this exam for various subjects like:-English, Bengali, Sanskrit, Hindi, Urdu, Commerce, Economics, History, Philosophy, Political Science, Education, Chemical Sciences etc. The WBCSC had earlier published the notification during September month of 2014 vide the Advt No. 18/SET/14. There are large number of candidates have applied for this examination and are waiting for their WBCSC SET Admit Card 2014 to attend the exam. All the candidates can download their WBCSC SET Call Letterat the official website at – www.wbcsc.ac.in. As per the official notification of West Bengal College Service Commission will conduct the State Eligibility Test on 14th December, 2014 at the various centersWest Bengal state. There are total 23 subjects for which this test will be conducted. The WBCSC upload soon the WB SET Hall Ticket 2014 for this examination will be published on the official website of this commission. 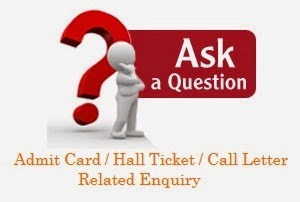 Admit Card is very important document and No Candidate will be allowed in Examination hall without Admit card. Admit Card is compulsory for all the candidates .